Salvatore DiMaggio first appears in the Painesville, Ohio, area in 1910. Salvatore DiMaggio was born on April 11, 1880, at Palermo, Sicily. He married Giovanna Caporrino sometime before 1909, in Sicily. Salvatore DiMaggio immigrated to the United States on May 7, 1907. He was returning to Pittsburgh, Pennsylvania, where he lived from 1907 to 1908. He was joining his brother, Pietro DiMaggio, in Pittsburgh. Salvatore was living in Painesville in April, 1910, when his brother-in-law, Ignazio Mansueto immigrated to Painesville. He was living in Painesville in November, 1913, when his cousin, Salvatore D’Aiello, immigrated to Painesville. Salvatore’s brother Pietro DiMaggio also migrated to Painesville. Salvatore DiMaggio registered for the World War I Draft on September 12, 1918. He was living at 627 North State Street, Painesville, Lake County, Ohio. 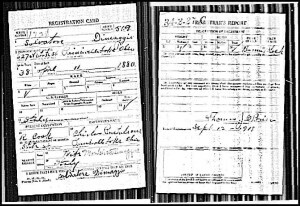 Salvatore’s wife was living in Italy when he registered for the World War I Draft. Salvatore’s wife, Giovanna Caporrino, probably was related to Painesville Italians, Giuseppe Caporrino and Salvatore Caporrino.